Donna Edmonds Mitchell is an inspirational poet and storyteller who is a Perry Clan Descendant of the Pocasset Wampanoag Peoples. I choose to interview her because she has done an amazing job of inheriting the responsibilities connecting the Perry Clan and the original Watuppa Reservation. She shared her family’s rich story of survival from the early 1700s to the present, in ways that keep alive indigenous people’s history and spirit. Chu: Your family's history of survival dates from the early 1700s to the present day. What specific wisdom and other resources enabled them and you to survive and to thrive? Was the ability to have and then to retrieve rights to the original homestead essential? Edmonds Mitchell: We never lost the wisdom of our elders. In fact, our forced assimilation created an inner, secretive way of being that keeps us connected to our cultural relationships with all life forms. We think every human and animal and even plants have their own life, their own heartbeat. So we treat them with respect. Shortly after the invaders arrived, we developed strategies, as clans of indigenous nation peoples, to maintain our traditions while adhering to the invaders’ westernized philosophies and lifestyles because our survival depended on it. Even though their intention was to “take the Indian out of the child,” the plan was never 100% effective. To this very day, they continue to do the same, but now nearly all nations are working together to take our stolen lands back. Chu: Are the Perry Clan and the original Watuppa Reservation unique in how they kept their memories and legacies alive? Edmonds Mitchell: Yes. Absolutely. Its uniqueness is that the lands were put into trust under the guardianship of the Commonwealth of Massachusetts by the infamous Indian-killer Benjamin Church for the 13 Wampanoag clans living on their ancestral territory from what is now called Tiverton, Rhode Island to Freetown, Massachusetts. The Perry clan has followed and will follow the matriarchal ways of our culture. Chu: You use photographs and original stories and poetry to bring the past into the present. What are some examples of past indigenous practices that remain highly meaningful to Native people living today? Edmonds Mitchell: In my opinion, it seems that the only peoples allowed to bring their past into the present are ones who claim European descent and western ideologies and philosophies. However, one's bloodlines are not necessarily reflected in their skin hue. Most nation clans did not live within racially-biased societies. The color of one's skin was not thought to correlate to the character attributes of truth, honor, respect, compassion, or reciprocity. The deeds of the invaders reflect none of these attributes. Rather their actions reflected how they treated each other on their ancestral lands in Europe. When one comes from a conquer-and-control mentality, one’s conscience has been suppressed at such a young age that one is incapable of building relationships with others whose culture, tradition, or spirituality differ from one’s own. Of course there are wrong-thinking persons within all nationalities and ethnicities. However, the majority of indigenous peoples living on their ancestral lands of North, South, and Central America as well as the African continent still live in communal clans and nations. In short, we rarely forget our original teachings of living in oneness or sacredness with all life forms. We continue to bring our ways into the present. Chu: While the largest museum in the U.S. dedicated to Native peoples is based in Connecticut and many people have heard of the King Phillip’s War, many Americans assume that indigenous people of the northeast of the United States were more completely obliterated than in other regions of the United States. What would you like people living in the U.S. today to understand about the Native people of Rhode Island and Massachusetts and the larger northeast region? Edmonds Mitchell: Throughout our histories, pre- and post-colonization or the KPW, we have always maintained relationships with our neighboring nation peoples. Hence, most of us have bloodlines mixed with other nation peoples as well. Our languages stem from the same linguistic root of the Algonquin language as far north as Canada and South to the Mississippi. Our waterways provided easy travel along the outer coastlines, and lakes and rivers where trading took place or solstice and seasonal ceremonies were performed as part of our spiritual beliefs. Once the invaders arrived here, all nations observed how dishonorably they treated each other and the natural surroundings. They spoke of “their God”, yet, to them, nothing was sacred. Everything and everybody was a commodity to be conquered, controlled, or killed with a specific intention— to make as much money as possible. Even though it took over forty years to commence the KPW, the indigenous nations communicated with each other about their observations. When word got out about the destruction of a village, while burning our elders, women, and children, our survivors sought refuge with our surrounding nations that had not yet been affected. If you have ever attended a powwow, you’ll see all indigenous nations of the North continent and beyond represented. Many dances are intertribal. We are still here, strong and vibrant, continuing our sacred ceremonies while individually and collectively honoring and living in harmony with our natural surroundings. We are still never taking more than we need and still sharing our ways of being one with nature in hopes we can together protect all of life. We taught the invaders how to survive on our lands, so only a fool would believe that we all died off. We are still here! Chu: You are very committed to giving voice to your ancestors while bridging the gaps between Southeastern Clans, Bands, and Tribes. How do you foster collaborations between different clans and bands of people? What are the major obstacles? What are the most effective resources? Edmonds Mitchell: We have never lost our clan, band, or nation collaborations. They have always been and will continue to be a crucial part of our being. The system built by the invaders’ government was meant to divide and conquer. There was a time when such tactics were successful. However, we have always been adaptable with our surrounding. Because of this, we still maintain the roots to our culture, traditions, and spirituality. Our biggest obstacle is to get non-indigenous people to listen to and believe our truths. The history books written by the invaders are believed to be the truth while ours are believed to be the myth. However, their writings are the myths used to have others believe they were justified in their actions. Very few are willing to admit that they got where they are today off the deaths or enslavement of indigenous peoples. Our time for truth is now. Our most effective resources are the continuation of our nation-to-nation collaborations. Red Power is on the move across all nations. Chu: You aim through storytelling to communicate the multiple effects of colonization and forced assimilation on indigenous people. What are those effects? Does understanding them better change the lives and self-understanding of Native and non-Native people? Edmonds Mitchell: One cannot change the reality of what was done. But one can admit to the wrong-doings and take the appropriate actions to build a mutually beneficial way of living. Such actions would include honoring our treaties or agreements, our traditions, culture, spirituality, and relationships with the natural world. Chu: Many Native American people are very mixed in racial and ethnic terms. You are an Afro-Native American. Are there many Afro-Native Americans? Do they face distinct challenges that non-Afro Native Americans do not share or that non-Native African-Americans don’t experience? How do you understand these distinct and overlapping elements of who you are? Edmonds Mitchell: First and foremost, we are all mixed race. Every race, from the beginning of time, is mixed. All European peoples have traveled across the many oceans to different continents to trade resources. Many of them had relationships while there. Indigenous peoples very rarely sought to travel from their ancestral continents. Most were taken from them by colonization or enslavement. The color of one’s skin does not reflect one’s ancestral bloodlines. Race ideology originated from the European philosophy of divide-and-conquer. However, the culture and traditions of your clan, band, or nation are passed generationally. I was raised in the culture, traditions, and spirituality of my Wampanoag nation by my ancestors who survived colonization and assimilation. I am neither Black nor White. I am indigenous First Nation! 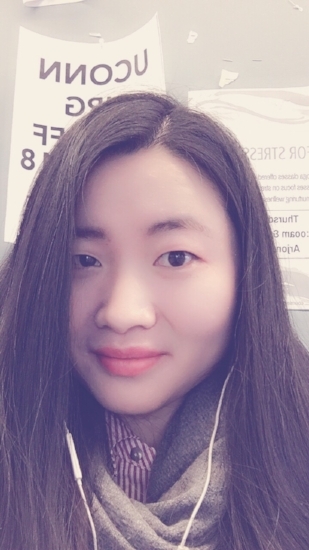 Hanli Chu is a student in the Masters of Science program in Quantitative Economics at UCONN where she is also enrolled in the Graduate Certificate in Race, Ethnicity, and Politics. She observes that injustice makes her sick and that she hopes many things can be done to address it, even if doing so will be a long haul. She can be reached at hanli.chu@uconn.edu.